Deep down, though we may try to deny it, we all love a little bit of history. It connects us with the past and in many ways maps out the road for the future. Sadly, we rarely appreciate the history we see daily on our door steps, probably because it’s just too familiar. We only truly appreciate history and culture when we travel to somewhere different. Well, if you’re looking to absorb a little local culture and get a taste for the past, then there are fewer better places to visit than the Ionian Island of Corfu. We’re pretty sure you’ll be amazed by the incredible wealth of history that this beautiful island holds. Our recommendation is to hire a car as soon as you acclimatise to your holiday Villa, and spend the day travelling around this green and verdant island. There’s history waiting for you round every corner. There’s just so much to see, that it wouldn’t surprise us if re-book your Corfu villa holiday the moment you return back home. And to be honest, we wouldn’t blame you either: you wouldn’t be the first holiday maker to have done that. So what makes Corfu different from the other Greek Islands? Well, it isn’t just the mesmerising natural beauty, the friendly people and the rich and varied culture that has the tourists flocking back every summer. It’s the fact that Corfu is different. It looks and feels different, and there’s a reason for that. Corfu lacks the Turkish influence of the other Greek Islands. The only true occupying power on the island historically was the Venetians. That’s why there’s such a notable northern Italian influence in both the architecture and the cuisine. The Venetians ruled for more than 400 years, from 1386 to 1797. 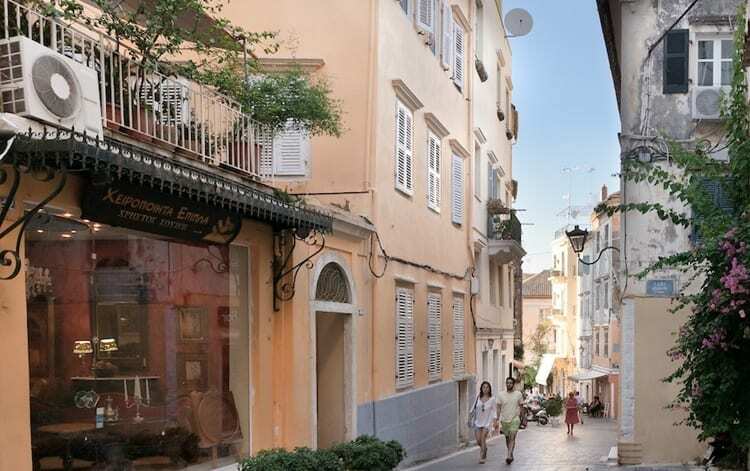 The Old Town of Corfu is still lined with beautiful multi-storied Venetian buildings. The Venetians were eventually dethroned by Napoleon’s army. However, the brief French rule ended with their defeat by the English, who made the island part of its protectorate. Corfu only finally joined the unified Greek state in 1864, when it was incorporated with all the other Ionian Islands. Just behind Liston, there is the church of Saint Spyridon, the patron saint of Corfu. It’s famous for having the tallest bell tower on the island. But Saint Spyridon isn’t the only lovely church in the Old Town. There are lots of historic churches dotted throughout. If you’re looking for views, however, then probably the best place to make for is Kanoni, the highest spot in the town. On the way there it’s worth pausing briefly at the palace of Mon Repos, the summer residence of the former royal family of Greece. Once you reach Kanoni, you’ll get an amazing view to Pontikonisi, and the church of Panagia Vlacherna.